Students, faculty, administrators and the Mayor of Harlingen came together to make history at Memorial Middle School on Nov. 6. To celebrate its new location, 1901 Rio Hondo Rd., Memorial hosted a ribbon cutting ceremony. The celebration focused on the past, present and future of the campus. The Memorial Jazz Band played spirited music as the audience entered, and students paid tribute in silence as the Harlingen High School Colorguard began the ceremony with the traditional presentation of the colors. 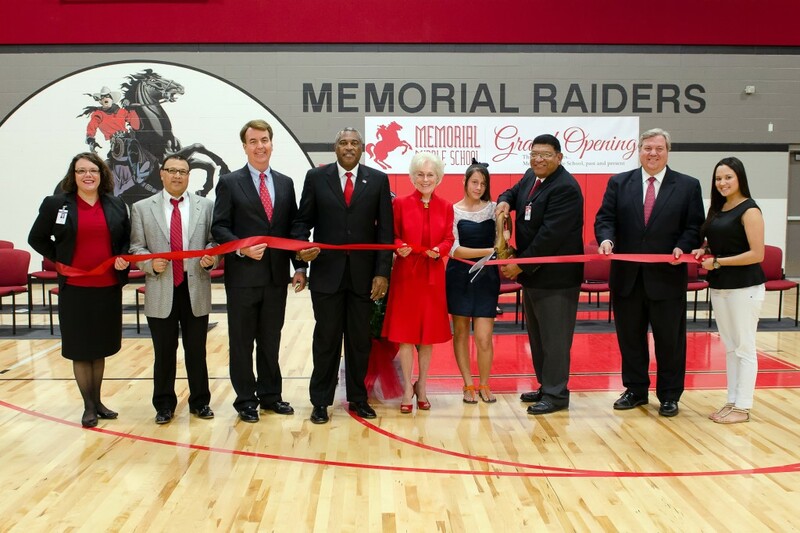 Former Raiders took the stage to express their appreciation for what the campus had done for them, and their hopes for the current and future students at Memorial. The event may have been focused on the new campus, but the individuals that were involved with getting the educational facility to its grand opening were not forgotten. Presenters took time to show their appreciation for the critical role they played in the day. The new location has not changed the Raider pride and traditions the campus upholds. Students collectively cheered as they were reminded of their old campus, and the great things ahead of them in their new facility. The campus opened its doors to 808 students on Aug. 27. The first junior high school in Harlingen, Memorial or originally Minnie B. Gay Middle School was opened in 1948. Memorial is the first completed project of the 2010 Bond Issue. Voters approved the $98.6 million bond in spring 2010.